Sinusitis simply means your sinuses are infected or inflamed, but this gives little indication of the misery and pain this condition can cause. Normally, sinuses are filled with air, but when sinuses become blocked and filled with fluid, germs (bacteria, viruses, and fungi) can grow and cause an infection. Who Gets Sinusitis (Sinus Infection)? What Are the Signs and Symptoms of Sinusitis (Sinus Infection)? Diagnosis of sinusitis can be difficult as its symptoms can mimic those of a common cold. In order to make an accurate diagnosis the doctor will take a full medical history including an assessment of the nature and duration of symptoms. They will also perform a physical examination including looking in the ears, throat and nose. Examination of the nasal cavity and sinus openings with an endoscope (a small, thin telescope which enables the structures to be viewed through the telescope or on a television monitor). A CT scan (a specialised x-ray that allows a cross sectional view of the sinuses to be seen, also called a “CT Miniseries”). X-rays (less commonly used as CT scans give better resolution). How is Sinusitis (Sinus Infection) treated? Keep your nose as moist as possible with frequent use of saline sprays or washes. Avoid very dry indoor environments and use a humidifier, if necessary. Be aware, however, that a humid environment also may increase the amount of mold, dust mite, or cockroach allergens in your home; this is important only if you are allergic to any of those organisms. Drinking plenty of fluid - this helps to thin the nasal mucous and allow it to drain more easily. Avoid exposure to irritants such as cigarette and cigar smoke or strong odors from chemicals. Avoid exposure to substances to which you are allergic. If you haven’t been tested for allergies and you are getting frequent sinus infections, ask your healthcare provider to give you an allergy evaluation or refer you to an allergy specialist. Avoid long periods of swimming in pools treated with chlorine, which can irritate the lining of the nose and sinuses. Avoid water diving, which forces water into the sinuses from the nasal passages. 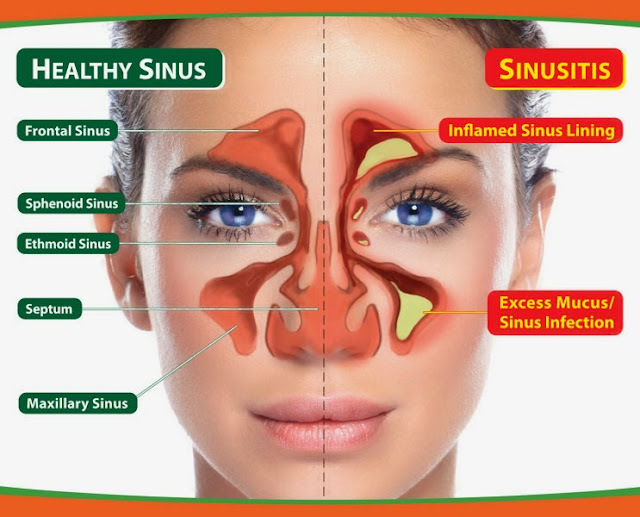 Are there home remedies for a Sinusitis (Sinus Infection)? Sinusitis (Sinus Infection) caused by viruses can use home (over-the-counter) treatments such as pain and fever medications (acetaminophen [Tylenol]), decongestants, and mucolytics. In addition, some health care providers suggest that nasal irrigation or a sinus rinse solution will help relieve symptoms of sinus infections, even chronic sinusitis symptoms. This irrigation is accomplished with a "Neti-Pot" or a sinus rinse kit (sometimes termed a nasal bidet). The last reference of this article shows a video of a sinus rinse procedure. In 2012, the FDA issued a warning about the use of Neti-Pots; the FDA cautions people not to use untreated tap water for rinsing, as contaminated tap water rinses lead to two deaths. Bacterial and fungal Sinusitis usually require antibiotic or antifungal therapy so home treatments without them are often not successful. However, some authors suggest home treatments may reduce symptoms after medical therapy has begun; some health care practitioners recommend nasal irrigation after sinus surgery.